It had been four years since I visited the wineries and pursued the sacred Pinot Noir of Willamette Valley, Oregon. Later visits along the Midwest wine trails of Illinois, Wisconsin and Michigan, and to the north into Quebec and British Columbia --- though providing pleasant surprises --- just didn’t satisfy. It was time to go to France. So in April and May of 2011, I travelled to Bordeaux, the Loire Valley and (couldn’t help it) Paris. The timing was perfect as were all of France and its people. Irrigation is regulated in France differently than it is for vineyards in the U.S., so vintage years can be more critical in the Medoc, say, than in the Napa Valley Also, French wine labels tout the region not the grape on the label (a good thing I think). And, of course, we all get bombarded by reports of the astronomical prices for wines of top chateaus (as if that were relevant for us 99%). All this can and does, I think, contribute toward many Americans not expanding our repertoire of wine enjoyment by experimenting with wines other than those we already know. How are we expected to try French Bordeaux if we are told a bottle costs $1,800? But Bordeaux does not have to be any more intimidating than Cabernet Sauvignon, Cabernet Franc or Merlot, with maybe a touch of Petit Verdot thrown in for spice. It’s a blend. And it is delicious. It does not have to be expensive. In certain years, when the grapes get enough moisture at the right time, and enough sun – when all the conditions are right – great wine is made in the fields. When conditions are not so accommodating, the wine maker’s skill is critical in preserving the reputation of the Chateau. (Perhaps more of this grape, less of that in the blend). But when conditions approach or are ideal --- ooh, la, la! And that’s why I said vintage years can be critical. Especially, if like me, you love wine – want to expand your experiences and have limited resources. There are great years for Bordeaux that people remember with lust and love: 1995, 2000, 2003, 2005. Conditions were so good and crop yields controlled (fewer not more grapes) so that value was to be had almost everywhere. The good news is that 2009, with some exceptions, is shaping up very well also. And 2009 is now bottled and will be widely available soon. So yes, if you are a lotto winner and want to spend $1800 for a Chateau Lafite Rothschild, by all means buy a Petrus and a Latour to go with it. But how would you like to enjoy really excellent Bordeaux wine and spend under $30? It can be done. People do it all the time. And the Mizer will help. Following is a list of 2009 Bordeaux at retail prices (approximate) of $30 or less. Wines are ranked by price. Next to the name is the region and the wine’s score (per Wine Spectator). The abbreviation “Ch” stands for Chateau. Unless you like only sweet dessert wines, you really can’t go wrong buying red Bordeaux at these prices. I recommend you buy a few bottles from different regions. Doing so, you will learn if you prefer a Paullac over a Margaux. If you like a particular wine, buy more and cellar it. Many of these wines can be kept for two decades or more (the Fronsacs a decade) and just keep getting better. Despite this, the 2009’s present fruit and can also be enjoyed young. And, if you do not have good storage conditions, it’s better to not buy too much. But to not buy any? Quel dommage! All of which brings us to the 2010’s. As wonderfully delicious as these 2009’s wines are, 2010 is the vintage of the decade. At Chateau Rauzon-Segla, I was blessed being able to taste the young 2010 vintage. Virgine Lamarqe of the Chateau described it as “2005 plus plus” and I agree. The 2010’s present not just a wine for you, but a wine for your new baby! (Oh, calm down and read on). You can keep this wine like a vintage port and present it to your child on his or her 21st birthday. And any child born in 2010 will be able to enjoy a wondrous wine from their birth year. These wines are keepers. The tastes are concentrated yet balanced and with wonderful finish. But this vintage will not be ready for retail yet, so we’ll save the discussion for later. Bordeaux has not had two years back to back like this since 1989 and 1990. These are wines to treasure, to store and to enjoy each year as they continue to improve in the bottle. Don’t miss out. The Loire? I can’t speak highly enough of the white wines from the Loire: The Sancerres and Pouily Fume and Savenniers wines (a.k.a. Sauvignon Blanc). These are the celebration of summer and “livin’ easy.” Vouvray (a.k.a. Chenin Blanc) dry or demi-sec is soft and fruity. To really come to terms with the use of the word “terroir” try a Sauvignon Blanc from New Zealand and contrast its grassy nose and mineral taste to the delicately crisp ever so slightly fruity fragrance and (I think) more complex taste of a Sancerre. Same grape, different wine. Different “terroir.” If you are a committed red wine only drinker, try a Chinon (a.k.a. Cabernet Franc), a soft and elegant rendition of this grape. Amazingly, so many of these incredibly delicious wines are available for under $20. Gobble up the 2009’s and 2010’s. Most of these are better drunk young (Vouvray) but some Sancerre can be cellared. Ask your wine merchant to recommend wines most suitable for your circumstances. Vive la France! 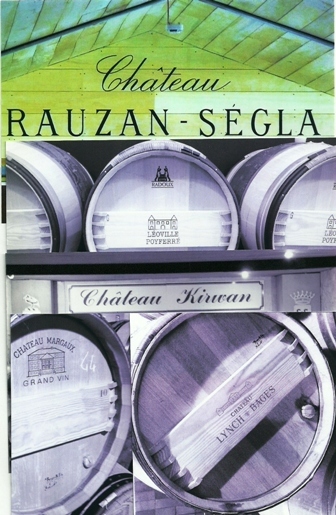 Special thanks go out to Virgine Lamarqe and Sandrine Begaud and everyone at Chateau Rauzan-Segla who were so gracious and accommodating (and make such remarkably delicious wine). It will be worth your effort to hunt down a bottle of their wine and enjoy it on a special occasion.